Mitakuyape (are now up against dangerous decisions that are coming from the disease of the mind. We are dealing with minds that hold no values of respect and honor toward another Nation’s Burials and Sacred Sites. Money has contaminated their minds to want the power to desecrate the sacredness of Mother Earth and allow my People’s burial places to be destroyed in order to continue to erase our culture. As Keeper of this Spirit Bundle of my People, we as the Buffalo People - Pte Oyate, have been able to keep our ceremonies and way of life for 19 generations in tact, which every generation is 100 years. This Bundle has been with us for over 2000 years, which has guided us through massacres and hard times, even when it was hidden until the 1978 Freedom of Religion Act. Tim Mentz –Tatanka Duta (Red Bull) and his family lineal knowledge are bound by this same woope – Creator’s Law. This knowledge is based on sacred oral history that dictates the word is sacred and stands in truth. Tim’s inherited knowledge in recognizing significant Sacred Sites and holds the same value for our People, as in my position, this is why I am able to carry an Honorary Doctorate Degree from the University of SD. We both have been raised with traditional knowledge with the responsibility to protect and carry, on behalf of our People. A person that earns a Degree can never attain that same knowledge we carry for our People. The Responsibility that we care for is passed down and learned through our oral history. 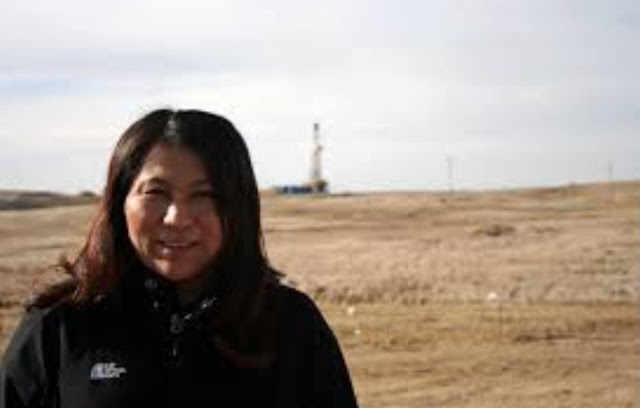 For this Oil Corporation to destroy what Tim Mentz, a cultural historical Tracker, identified as our Burial Mounds and Sacred Sites, is a violation to the UN Declaration on Rights of Indigenous Peoples. This also violates United States’ own Treaty with our People. What has now been allowed to happen is a violation in the highest level of disrespect toward a Nation’s Ancestors. The support this Corporation has are Political Leaders who have given themselves the Power in their elected positions, to violate their own Laws they are supposed to uphold; as stated in their own US Constitution in how Religions are to be treated. Where are the Keepers of their values? The hearts of All People’s faiths must now unite in believing we can change the path we are now on. We, from heart of Turtle Island, have a great message for the World to unite for our children’s future. Already we have witnessed many Nations of life are now dying because of contamination; those that swim, those that crawl, those that fly, the plant Nation, the four legged and now the two legged. What we are being faced with is a dark spirit. 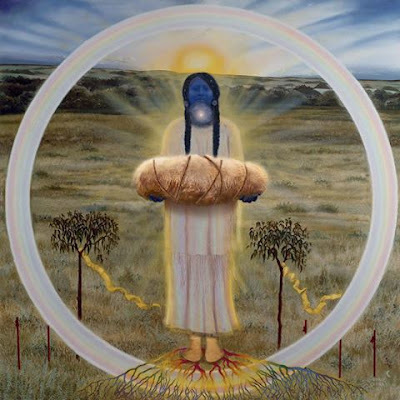 All life cannot afford to allow the same mistakes to be made any longer, look what is happening to the four directions in the contamination of Mni Wic’oni – water of life. If we do not actively stand up as Leaders and do Creator’s work in uniting our concerns, it will continue to be a domino affect that our Ancestors have warned about in the Prophecies. This is not a competition of who will lead and who should follow, this is a very serious time we are in. I know in my heart there are millions of People that feel this is long overdue. It is time that all of us become Leaders to help protect the sacred upon Mother Earth - she is the source of life and not a resource. In a Sacred Hoop of Life, where there is no ending and no beginning. We haven't had enough rain & its been very hot this year. The soil is dry & cracking. Still no rain on the way. For now we can just go turn on the faucet & get a drink. But it would of cost too much to buy water for a bigger garden, so we have very small garden. But, What about the future ? We need food from our garden next year. What will happen ? We are not ready to just give up. We went without food before. Ketchup sandwich, sugar sandwhich..
We went without warm clothes & shoes. We went without adequate heat in the winter, snow blowing through the cracks of the house. We had a big family living at home & shared bedrooms & bathroom. We had to make sacrifices. But water cannot be sacrificed. We need water to live. I may have enough water to last for as long as I live as I'm getting older, but what about the near future ? In the past people used water like we would never run out & also polluted our water. Now we must protect our water. It is stupid, arrogant , and greedy of some rich person or company to abuse their power and abuse mother earth. Its impossible to debate the importance of water with an ignorant person. Its intrinsic knowledge that the sanctity of water cannot be negotiated. Everyone should know & feel that! Its good to see how many people have gathered together to protect the Missouri River and other water ways. Thank you for the sacrifices you are making. Thanks to the youth who have had the spirit & vision to help. I AM PRAYING THAT THE PIPELINE IS HALTED. THIS BREAKS MY HEART. EVEN THOUGH I AM NOT THERE PHYSICALLY WITH YOU, MY HEART STANDS WITH YOU. WE NEED TO CLEAN UP D.C. THERE IS SO MUCH CORRUPTION AND GREED THERE. AGAIN MY SPIRIT IS WITH YOU AND, MY CONTINUED PRAYERS ARE WITH YOU. I WILL CONTINUE TO SPREAD THE NEWS ON MY FACEBOOK PAGE. My prayers are with my Native American,brothers and sisters.As they fight these horrible injustice!! God be with you!! Thank you Arvol Looking Horse for your wisdom and your words. Please do not stop speaking the truth. We the people need to hear what our spiritual leaders feel and know - it gives us strength and focus. Yes. It has always been, and will always be, that people with too much money/power will lose their connection to their own soul, the earth, their empathy, their reason. This will never change. Democracy is the answer, democracy that is more democratic than we have ever seen or imagined. We can do this because we have the internet now. This is the promise of the prophecies. This is the promise of White Buffalo Calf Woman. This is the promise of all religions.